Pairing a simple candle with a fancy votive is an easy way to add some elegance to your space. With this nature-inspired votive, you can also bring a little bit of green into your home without the mess or work of real greenery. The bonus? This DIY project is very easy and only takes minutes to make. Check out the video and instructions to see how you can make this nature-inspired candle votive for yourself. 1. Wrap a strip of painter's tape around the vase so the bottom edge of the tape is about two inches from the top. 2. Spray the vase with tacky spray below the tape. 3. Place the gold foil on the lower half of the vase, on top of the tacky spray. Press down on the foil until it completely covers the lower half and lies flat. 4. Spray the vase with Mod Podge. Remove the painter's tape. 5. 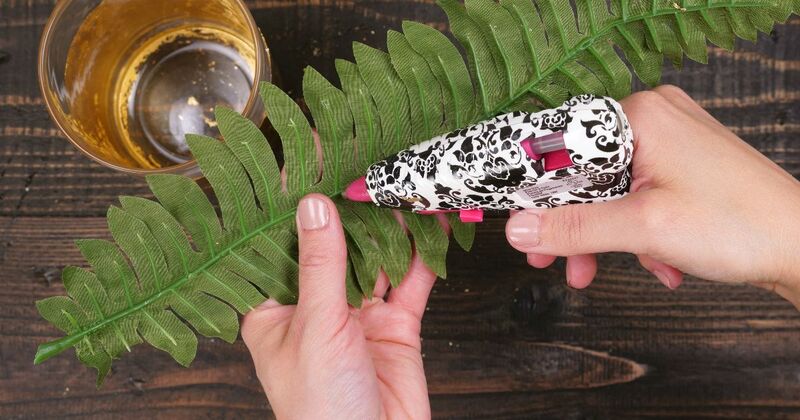 Apply hot glue to the back of the faux greenery. Press the greenery onto the vase.